Clint Eastwood as 90 year old Earl the Mexican cartel drug mule. Mules are stubborn creatures, unwilling to change paths, digging their heels in and doing what they feel is right. Earl is a bit like that. Unwilling to change as the internet booms and prepared to live off his almost rock star status within the horticultural world, his business ebbs away to nothing. His family relationships have suffered. Earl loved his flowers and subsequent awards so much he missed multiple family occasions and his relationships are almost beyond repair. Stubbornness has many consequences. All is not lost however as a chance encounter following a very public family row presents Earl with a new employment opportunity. All he has to do is drive. Drive, don’t ask questions and definitely don’t look at the packages you are charged with delivering. Yes, Earl has become a drug mule, trafficking multi million stashes across country while happily singing along to jazz in his car. Initial naivety about his cargo soon gives way to complicit participation as the envelopes of cash become larger and more regular. It’s not all bad though right? Earl must be a nice guy right? He’s just trying to get back on his feet again and I mean he’s 90 so we can’t not like him…….. But, Earl is a little racist (although granted across a broad non white spectrum), greedy and fond of threesomes in road side motels. Twice in fact! We are told though that because Earl is old, fought in the Korean war, of a different generation that this should somehow be allowed without question. 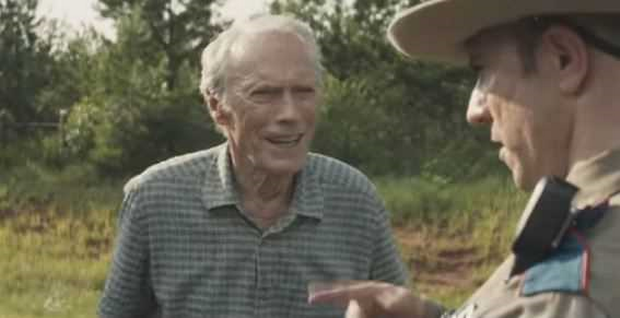 As director and star of this hard to like drama, Clint Eastwood wants you to believe that this somehow gives Earl a pass and somehow makes this acceptable!!!! It’s not all bad though (except it is) as Bradley Cooper & Michael Pena are in pursuit spurred on by their bosses desire for busts (which he repeats at infinitum). They are the good guys in pursuit of dealers, pushers and while seemingly knowing the whole cartel setup inexplicably obsessed with this cross country driver. I mean they COULD just arrest all the people they already know though the phone taps, surveillance and snitches they have in place but I guess that makes this pointless story even more pointless. Perhaps their head scratching methods in the face of all logic is a factor in why both Cooper and Pena look so dead behind the eyes throughout? This Mule is littered with racial stereotypes, dodgy politics and leering misogyny that is hard to take it seriously at all. It is an incredibly awkward viewing experience at times, with ham fisted attempts to balance out the problems with moments of emotional blackmail applied so blatantly it borders on amateur. There is no significance to any female character within the film, and any who do get screen time are either deemed by Eastwood to be nuisance or an object of his leering camera’s gaze. For something based on a true story, The Mule feel heartless soulless, awkward, remorseless and ultimately a problematic experience. Sometimes a decision must be made to put an animal out to pasture. It has served its purpose. It’s work is done. I wish no ill to Clint Eastwood, adored as he is by so many, but I’m certainly ready for this style of film making to be sent to the glue factory. The Mule is on general release from 25th January 2019.